Workplace Safety Blog | Safetycare | Safety Training Videos | Free Safety Pictures and Resources: 2 themes, 1 shocking work practice! 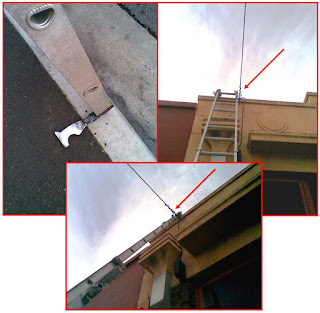 This picture illustrates a shocking work practice from an Electrical Safety perspective, and a Ladder Safety perspective. The top of this aluminium ladder was tied off with rope to stop it moving. Unfortunately, it was tied to the building’s live electricity supply cable feeding power from the electricity pole across the street! Unlike construction wiring, overhead supply cables are not required to be fitted with devices to protect persons from electrocution. Also note the novel method of ensuring the ladder is level. Ladder Safety DVD Click here to get it! Electrical Safety DVD Click here to get it!